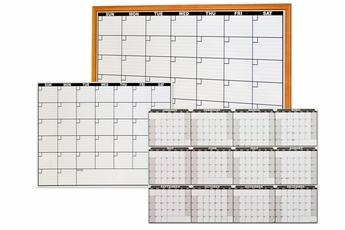 Frameless dry erase calendar decals from OptiMA Inc. give you our exclusive dry erase writing surface on easy to use peel and stick, self-adhesive calendars. Dry erase decals give you a flat contemporary look without the clumsy, traditional aluminum frame and marker trays of a framed whiteboard. Not just that but our dry erase decals ship rolled up in a heavy duty shipping tube and come to you via UPS vs. the extra cost and expense of shipping large framed calendars by truck. 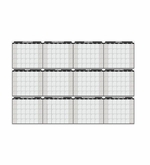 We have a great selection of dry erase yearly and monthly calendar decals from the small size of 2' x 3' monthly calendar up to a really super large 4' x 8' full sized yearly planning calendar. Every one of them is made in the U.S.A. with our exclusive Opti-Print™ method that covers the calendar print with our superior clear dry erase writing surface that erases cleanly and doesn't ghost. With minimal care and maintenance you'll get years of trouble free use from these dry erase decals. Of course if you don't see the calendar format or design that suits your specific needs we can always make a custom printed decal just for you. Try them once and you'll find out why so many others now rely exclusively on OptiMA dry erase decals for all of their dry erase planning needs. From "Size" "203: 24\" Tall x 36\" W (+$29.95)" "304: 36\" Tall x 48\" W (+$44.95)"
From "Available Sizes" "203: 2' x 3' Faux Frame Calendar (+$29.95)" "304: 3' x 4' Faux Frame Calendar (+$44.95)" "Faux Frames" "O: Faux Oak" "M: Faux Mahogany" "W: Faux Walnut"